I only add this one because I figure you're a fiber person if you're reading this blog. If not, I'm sure you know someone who knits or crochets, right? 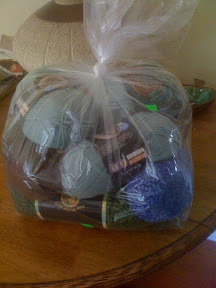 While you're out junking, keep an eye open for bags of yarn. That's how my local thrift stores package the yarn donations they get from overly ambitious crafters who planned to make a king size afghan but somehow never found the time (been there, done that). It also helps to look at buying yarn this way as a personal challenge - what do I 'see' in the yarn just waiting to be created? A hat? A scarf? Not to compare myself to Michelangelo and a block of marble or anything, but you get the picture.